The more than 270 members of the graduating class of Kahuku High School performed their traditional medley of popular songs last night during commencement exercises at the Cannon Activities Center in Laie. 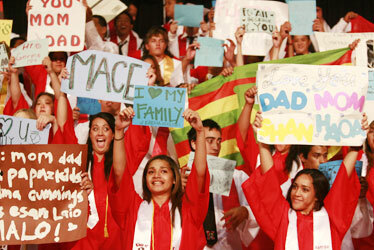 Kahuku's Class of 2008 took the chance to wave signs in thanks during their performance medley. Kahuku High School Class President Marie Jeanne Napaa shed tears as she thanked her school, classmates and parents.